"Vorlog! Listen — / Your name means Less Than Me / I define it thus." Vorlog is a Hive Knight with rotating shield types that appears as a boss in the Court of Oryx. 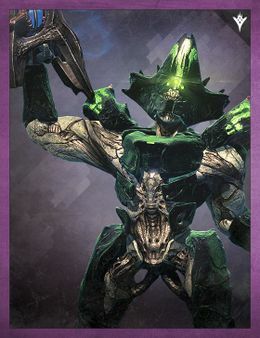 Vorlog once killed many Celebrants of Oryx as tribute to his master, Oryx, the Taken King. Despite praising this, Oryx rebuked Vorlog and defined his name as meaning "Less Than Me."